Dear Valued Customer: Construction’s technological revolution is on a dizzying pace. The industry has embraced telematics for gathering data; increased usage of GPS, drone surveying, parts ordering via the web; and more. Komatsu continues to be at the forefront with intelligent Machine Control dozers and excavators that are proven to increase production and efficiency, while reducing costs. Komatsu wants customers to realize the greatest benefit from its intelligent Machine Control equipment, so when it launched the machines, we worked together to add personnel to our staff who can provide high-level technical support. Komatsu has also introduced SMARTCONSTRUCTION, a suite of services designed to assist customers with drone surveying, jobsite setup, model building and much more. 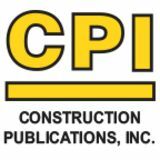 Read about the benefits of SMARTCONSTRUCTION in this issue of your DMI Difference magazine, then contact us to see how our SMARTCONSTRUCTION team members can be of service to you. Rear cameras are now a staple in the construction industry, allowing operators to use an in-cab monitor to see what’s behind them. Komatsu has taken the concept a step further with KomVision, which places multiple video cameras around a machine to give operators an all-around view. Check out the article on KomVision inside to learn more. If you want a wealth of information about your machinery, as well as the ability to find parts and fulfill service needs, the new MyKomatsu website provides it all in one convenient place. More details are in this issue. We also have informative stories about a customer using intelligent Machine Control dozers as well as Komatsu corporate trainers who can help you maximize production. We hope 2019’s construction season is a busy and profitable one for you. If there’s anything we can do to assist you, please call or stop by one of our branch locations. THE PRODUCTS PLUS THE PEOPLE TO SERVE YOU! 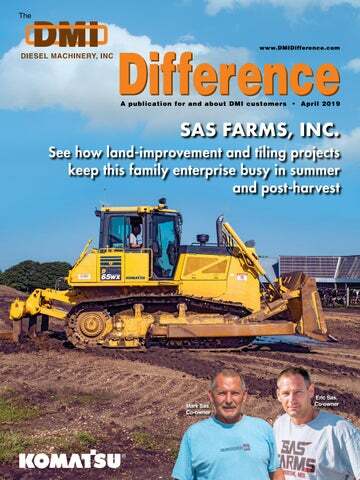 IN THIS ISSUE SAS FARMS, INC.
Read about the land-improvement and tiling projects that keep this family enterprise busy in the summer and post-harvest. Look at the reasons why one industry executive recommends keeping an open mind about hiring former employees. Find out what experts see on the horizon for the construction sector in 2019. Examine how recent infrastructure legislation is funding vital drinking-water and Army Corps of Engineers projects. Komatsu’s SMARTCONSTRUCTION initiative provides a wide array of offerings to help machine owners take full advantage of innovative technology. Explore the details in this issue. Take a look at how one equipment owner realizes greater production with lower costs thanks to intelligent Machine Control technology. Printed in U.S.A. © 2019 Construction Publications, Inc. Using a multi-shank ripper on a Komatsu D65WX-17 dozer, Eric Sas, Co-owner of Sas Farms, Inc., prepares the ground for a new feeding pad at a farm near Sioux Falls. “The dozer has a lot of versatility and power to work through muddy conditions,” said Sas. Eric Sas (far right), Co-owner of Sas Farms, calls on Diesel Machinery, Inc. and Sales Rep Dar Ellis for new equipment. Eric’s three sons enjoy being around the machinery, and may be the next generation to be involved in the family business. Next generation The current volatility in the agricultural markets means the stability and additional income from their land-improvement business is important to the Sas family. From Eric’s perspective, the company allows him to work closely with his dad and uncle, and he hopes that continues with his three sons as they get older. The largest complaint that I hear from most contractors is their inability to get good workers. That situation hasn’t improved with the current low unemployment rate, combined with what is fast becoming a shortage of immigrant personnel. One source you may not have considered are your former employees, often called “boomerang” workers. This is yet another reason to maintain a cordial relationship with employees when they leave for what they perceive as a better opportunity. Why not ask them if they want to come back, especially when they have shown they are diligent in their jobs? Each of us makes decisions based on our personal needs at the moment. These may change through time, of course, and a previous work environment may look better with the visibility of hindsight. If you have created a great culture at your organization, this should lend confidence that if circumstances have changed for the employee, then coming back to work for you will appear attractive once again. you. There is a natural tendency to feel that returning to a former employer is a step backward in a career. It will be up to you to show them why that is not the case. You may also want to consider if there are any benefits you might be able to provide to confirm that returning to work for you will be positive for them and their families. ■ Ranger Kidwell-Ross is a multi-award-winning author, who has provided advice to contractors in the power sweeping industry for more than 30 years. He is Editor of the largest website for that business sector, WorldSweeper.com, as well as Executive Director of the World Sweeping Association. In this tight labor market firms should consider rehiring former employees, suggests Ranger Kidwell-Ross, Executive Director, World Sweeping Association. “If you have created a great culture at your organization, this should lend confidence that if circumstances have changed for the employee, then coming back to work for you will appear attractive once again,” said Kidwell-Ross. Forecasters seem to agree that 2019 will continue the ongoing trend of growth in the construction industry, albeit at a slower pace than in previous years. The Dodge Construction Outlook report predicts total starts will reach nearly $808.3 billion, up from the $806.8 billion it projected for 2018. “The fundamentals continue to be sound, and I don’t think we’re going to be seeing a repeat of what took place in 2008 and 2009,” said Robert Murray, Chief Economist for Dodge Data and Analytics. The American Institute of Architects predicts 4 percent growth in 2019 for nonresidential construction, which includes several market sectors. A decade ago, the overall economy went into turmoil, then began recovering from one of the worst downturns since the Great Depression. Construction was especially hard hit, causing hundreds of businesses to close or severely cut back on staffing. Millions of construction workers were let go and never returned to the profession. Dodge Data & Analytics and the American Road & Transportation Builders Association (ARTBA) forecast transportation infrastructure expenditures to rise in 2019. Dodge sees 3 percent growth in the market, while ARTBA eyes an increase of 4.2 percent. Dr. Kermit Baker last fall. “Its forecasts were marked up to 4.7 percent growth in spending for 2018 and an additional 4.0 percent in 2019. If these projections materialize, by the end of the next year the industry will have seen nine years of consecutive growth, and total spending on nonresidential buildings will be 5 percent greater – ignoring inflationary adjustments – than the last market peak of 2008.” AIA also foresees that the commercial/ industrial market will gain 3.4 percent, led by industrial at 4.9 percent. The organization projects office space to expand by 4.1 percent, hotels by 3.6 percent and retail by 2.7 percent. Congress recently passed and President Trump signed America’s Water Infrastructure Act that authorizes more than $8 billion for a wide range of undertakings. The measure divides the total dollars, with $3.7 billion dedicated to Army Corps of Engineers work and $4.4 billion for drinking-water projects. The legislation includes authorization of the Water Development Resources Act (WDRA), giving the Army Corps of Engineers funds for work on items such as locks and dams on the nation’s rivers, which are used to convey commodities, including aggregates and grain. “A WDRA bill establishes the priorities,” said Mike Steenhoek, Executive Director of Soy Transportation Coalition in a harvestpublicmedia.org story. America’s Water Infrastructure Act allocates more than $8 billion for a wide range of projects. It authorizes the Water Development Resources Act and reauthorizes the Drinking Water State Revolving Fund. Reauthorization of the Environmental Protection Agency’s (EPA) Drinking Water State Revolving Fund for the first time since 2003 is included in the act. It doubles the loan program’s authorized spending to $1.95 billion by the third year. “FAILURE IS NOT AN OPTION IN THE JUNGLE.” THE MOST RELIABLE. Technology continues to evolve at a rapid pace in the construction industry, and those companies that embrace and fully utilize it are more likely to win future bids and finish jobs faster and more profitably. Komatsu is committed to helping customers optimize their jobsite productivity through its SMARTCONSTRUCTION suite of offerings, including intelligent Machine Control dozers and excavators. source for solutions that help intelligent Machine Control users maximize production and efficiency. Available through Komatsu distributors, SMARTCONSTRUCTION provides aerial mapping, 3-D modeling, training and consultation, GPS hardware and jobsite setup. Komatsu-certified Technology Solutions Experts (TSEs) and SMARTCONSTRUCTION consultants can assist customers with technology implementation as well as optimization of the jobsite. One popular SMARTCONSTRUCTION service is aerial mapping, which gathers topographic Continued . . .
Komatsu’s SMARTCONSTRUCTION program provides one-stop solutions to help intelligent Machine Control users maximize the advantages of the technology throughout a project. data from above. Surveys can be completed before, during and after a project to measure existing and ongoing volumetric changes, stockpile calculations, record amounts of material moved and gather final as-built data. Anetsberger said customers are amazed by the resolution and accuracy of the data collected. The highly detailed information gathered prior to the start of a project helps in preparing better estimates and bids, as well as in jobsite planning for greater production and efficiency. During the construction phase, drones can finish numerous surveys per day without disrupting an active jobsite. That allows companies to get a more accurate picture of progress in less time compared to traditional methods. Komatsu Technology Solutions Experts and SMARTCONSTRUCTION consultants play a vital role delivering SMARTCONSTRUCTION services on the jobsite. Trained and certified by Komatsu, they are specialists at deploying technology to help operations run at peak efficiency. Allows excavation companies to concentrate on moving dirt SMARTCONSTRUCTION personnel can not only help companies utilize the data collected from aerial mapping, but also with other data services such as takeoffs. 3-D data modeling services are offered to provide customers of all sizes and capabilities with information for their GPS equipment. Komatsu and its distributors have partnered with leaders in aerial mapping technology so that customers can enjoy the benefits of highly accurate, yet quickly gathered topographic data. “THEY JUST WORK BETTER!” A TRUSTED NAME. Good decisions are often directly tied to profitability and prosperity. Justin Lott, Co-owner/Senior Vice President of Southern Transport & Equipment, LLC, learned that lesson after completing fire school. “I had my sights set on being a firefighter, but I had to finish EMT training as well,” recalled Lott. “The summer after I graduated, I took a job working for an oil-field company to make some money. I quickly realized that type of work paid much better than I was projected to make as a firefighter. I was given an opportunity to grow with the business that I worked for, so I took it.” Lott started his own land-clearing and earthwork firm to keep busy during breaks in the company’s two-weeks-on, two-weeks-off schedule. Those side jobs eventually evolved into a full-time business, and after a few years, he combined forces with three other entrepreneurs to form Southern Transport & Equipment in 2017. Control D65PXi-18s, a D61PXi-24 and a D85PXi-18. “No matter the size of the dozer, the integrated GPS system works flawlessly,” reported Lott. “The costs savings are apparent. Fuel usage is down, while production and efficiency are up. We love that there are no masts or cables to install or remove every day. That increases time spent moving material.” The company has invested in standard Komatsu machinery as well, including a WA500 wheel loader it uses to fill trucks at a gravel pit. On some projects, Southern Transport & Equipment utilizes PC360LC-11 excavators and HM400 articulated trucks to move mass amounts of material. Scan to watch a video of one customer’s experience at Demo Days. The newest addition to Demo Days was a timed event where attendees operated a Komatsu PC55MR-5 compact excavator and competed to place three rubber balls into a bucket as quickly as possible. The recent, three-day Demo Days event included more than 40 machines for guests to operate at the 45-acre Cartersville Customer Center demonstration site. Versatile equipment is a requirement for customers in agricultural applications. Machines that can handle multiple jobs make operations run more efficiently and remain profitable. With that in mind, JCB released its largest articulated telescopic material handler, the TM420. “The TM420 provides users with the maneuverability they expect from a telehandler and the muscle they demand from a wheel loader,” said JCB General Manager for Agriculture Ray Bingley. “It’s perfect for all types of agricultural material handling applications, especially where extra lift or reach is needed, such as loading feeders and storage bins or cleaning out stockyards.” The TM420 was purpose-built for the agricultural sector. It features a class-leading lift capacity of 8,550 pounds thanks to its Tier 4-compliant, 4.8-liter JCB EcoMAX engine with variable geometry turbo that produces 145 horsepower and 560Nm of torque at low levels to reduce fuel consumption. Tough and smart What good is sheer force if it isn’t efficient? The TM420 delivers its best-in-class power while also improving cycle times and reducing fuel consumption through JCB’s new Smart Hydraulics package, which makes the most of every drop of fuel in boom applications. The Smart Hydraulics package also includes end-of-stroke damping on boom lift, extension/ retract and attachment dump cylinder to improve material retention and smoother cycles. The optional Auto SmoothRide System engages at speeds in excess of 2.5 miles per hour to boost comfort and productivity. ■ The JCB TM420 articulated telescopic handler was purpose-built for agricultural customers. It features a class-leading lift capacity of 8,550 pounds with a maximum lift height of 17 feet, 8 inches and a forward reach of 10 feet. The TM420’s telescopic boom has a maximum lift height of 17 feet, 8 inches and a forward reach of 10 feet. Operators can load confidently with the centrally mounted lift, tilt and extension rams that eliminate boom twisting and utilize keyhole castings for greater structural integrity. JCB also made maintenance easy. Engine and hydraulic oil ports as well as fuel and air filters are located at easy-to-access locations; diesel and DEF tanks can be filled at ground level; and the self-lubricating boom wear pads and dry-boom lubrication ensure virtually maintenance-free operation. Those attributes, combined with the fact that the TM420 engine does not require a diesel particulate filter, help to dramatically reduce downtime related to service. Attention to detail is the key for Komatsu’s Arizona Proving Grounds General Manager Neil Johnson This is one of a series of articles based on interviews with key people at Komatsu discussing the company’s commitment to its customers in the construction and mining industries – and their visions for the future. Neil Johnson has spent his entire career with Komatsu. After graduating with a degree in mechanical engineering in Newcastle, England, he began conducting research and development on excavators for Komatsu UK Limited. ANSWER: It’s a 660-acre facility in Sahuarita, Ariz., where up to 40 employees conduct research and development primarily for Komatsu mining haul trucks. However, with the formation of Komatsu Mining, we are expanding our reach to test other mining products. We currently have a PC7000 excavator and P&H 77XR drill here. QUESTION: What kind of testing takes place at the facility? In 2009, he moved stateside to Komatsu’s U.S. Test Group (USTG) in Cartersville, Ga.
ANSWER: We focus on three types of testing: performance, structural and durability. Typically, we address the first two on our site. We have a mine operation set up here, and we spend hours running the equipment through various exercises. Once we complete performance and structural testing, we closely monitor the durability of the machine at a customer’s site for approximately 2,500 hours. QUESTION: What role does the Arizona Proving Grounds play in the development and testing of Komatsu’s Autonomous Haulage System (AHS)? Two years after arriving in Georgia, he moved to the Arizona Proving Grounds, where he served as Chief Engineer and was eventually promoted to his current role of General Manager. His tenure at the facility has included several exciting projects. ANSWER: We are the only Komatsu site that engages in AHS development and benchmarking. We have the same testing process for AHS as we do for the trucks. The group in Peoria, Ill., handles the design and integration, and we put it to work in the field to validate performance. We ensure that the sensors in all structures meet life expectancy and measure stress as well as vibration on those components. “For nine years, I worked with wheeled, crawler, high-reach, roadrail, super-long-front and utility excavators,” recalled Johnson. “One of the major events was moving to this current facility in 2015,” noted Johnson. “We put a lot of thought into the building design, test courses and the mining site, in addition to installing permanent infrastructure for the Autonomous Haulage System.” In his free time, Johnson enjoys traveling with his wife, Angela, and riding motorcycles, in addition to mechanical projects. QUESTION: What is the Komatsu Arizona Proving Grounds? equipment. Our group performs a stability test, which is a 150-hour exercise that searches for any failures in the system. If issues are detected, they are addressed and testing begins again. We pride ourselves on delivering products and technology that perform to our customers’ high standards from the very beginning. QUESTION: In addition to addressing equipment and technology, are there other ways you help customers increase productivity? In addition to equipment and technology testing, the Arizona Proving Grounds evaluates mining site plans to help customers layout their operations in the most efficient manner. ANSWER: While equipment and technology are major components to efficient operation, we also look at site design. Sometimes removing three stop signs from an operation or changing an incline can result in significant fuel savings, so we work with customers to address those as well. QUESTION: What does the future look like for the Arizona Proving Grounds? ANSWER: We have several new things coming up, including larger customer events. In the past, we primarily hosted individual customer demos, but, for the first time, we recently held an AHS event for a group of customers, and we have others planned. It’s exciting to open the doors to the facility so that people can see it and experience the equipment, because both are really impressive. Ask any group of construction equipment owners about the importance of their operators, and chances are you will hear very positive comments about the people in their cabs. That’s because, according to Kurt Wilson, it takes a combination of well-designed machines and proficient operators to achieve top production. (L-R) Komatsu Corporate Trainers Kurt Wilson, Todd Bresemann and Jason Gillard assist companies in improving return on investment through hands-on and classroom learning. Training can be arranged through your Komatsu distributor. Jobsites are often described as choreographed chaos – multiple machines and workers completing tasks in tight spaces and under extreme deadline pressure. That is why Komatsu developed KomVision, a multi-camera system that helps operators better track activity around their machines. first-person view of the operator. KomVision’s view reaches beyond a fully extended arm and bucket to cover the entire work zone. Additionally, the counterweight swing radius is marked with a red line while a yellow one denotes a “caution area” with a radius that is two meters wider. KomVision uses software to stitch together video from mounted cameras and then displays it on the in-cab monitor in real-time as one image that looks as if it were filmed from above the machine. Operators can use the default, split-screen mode, which displays the bird’s-eye view on the left and a selectable camera view on the right, or they can switch to full-screen mode to display the feed from all cameras simultaneously. KomVision uses multiple cameras mounted on the exterior of an excavator to compile video from the machine’s blind spot and then uses software to stitch it all together and display a real-time, bird’s-eye view on the in-cab monitor. KomVision is currently available on six Komatsu excavators – PC170LC, PC238USLC, HB365LC, PC650LC, PC1250 and PC1250LC – and Moncini expects that number to increase in the near future. The MyKomatsu website (https://mykomatsu.komatsu) provides a wide range of information to track equipment, including hours, load factors, cautions and more. “Users can monitor their fleet and find the items necessary to maintain it,” said Rizwan Mirza, Komatsu Manager, KOMTRAX, Products and Services Division. Free and easy-to-use The MyKomatsu website (https:// mykomatsu.komatsu) will offer a familiar suite of all-inclusive telematics solutions, allowing owners to access information about their equipment location, machine hours, load factors, cautions and more, as reported through Komatsu’s existing telematics resources, such as KOMTRAX or KOMTRAX Plus. Signing up for an account is free and simple and can be done through your local Komatsu distributor. “You can get a general overview of an entire fleet, such as average idle time, as well as have the ability to drill down to specific machines for greater detail,” said Mirza. “For example, owners can take a quick glance at the machine’s performance or health; pull up a specific machine’s spec sheet; look up operator and maintenance manuals or parts and service news; plus use a catalog to find a part and place an order online with a local Komatsu distributor.” “To best serve our customers and continue to earn the right to be their partner in business, we are offering tools to simplify the entire ownership experience. Being able to view and manage your business in this environment in the same way as you do in reality was the smartest place to start,” added Chapeck. ■ For more information or to register for MyKomatsu, contact your local authorized Komatsu distributor. Komatsu’s FrontRunner Autonomous Haulage System passed the 2-billion-tons hauled mark recently. Commercial deployment of the driverless trucks began in 2008, and today there are more than 130 of them in operation around the world. CONEXPO-CON/AGG was named as the number-one exhibition in any industry in the United States, and ICUEE-The Demo Expo took the number-three spot in the annual Gold 100 list of top U.S. trade shows. Trade Show Executive (TSE) magazine compiles the rankings based on exhibit space size and also presents awards in several exhibition categories. Komatsu is partnering with the Chicago Blackhawks National Hockey League team for the 2018-19 season, and its logo will appear on the ice during regular-season home games. It is the company’s first agreement with any Chicago pro-sports franchise and will expose Komatsu to more mainstream, national and international TV audiences. Thinking Forward, an Association of Equipment Manufacturers (AEM) podcast, is now available for listeners and subscribers on many popular podcast apps, including iTunes, Stitcher, Google Play and TuneIn. Episodes will also be posted on the organization’s website (aem.org/think). Podcasts are part of AEM’s expanding scope of efforts to keep members apprised of potentially disruptive trends in the construction and agriculture equipment industries. It explores different cutting-edge topics every month. Can you spot what is different? There are 10 differences between these two pictures. Test your power of observation, then scan the QR code to check your answers. F E ATURE D U SE D E QU IPMENT Call for more information: (800) 456-4005 See more at: www.dieselmachinery.com Year	Mfgr./Model/Descr. Special low finance and lease rates on most used equipment! Equipment subject to prior sale or change without notice.